The principles of The Star Performance System have been helping companies tap into and get the most from their people since 1984. We promise and deliver real, measurable and sustainable results, world class expertise, some of the finest developmental tools available anywhere and a guarantee that can’t be beat. The quality of our work has earned us many fans over the years and our personal attention has turned many of our clients into lifelong friends. We invite you to explore our site and then contact us for a free needs analysis and consultation. Besides our core team of experts, we have a network of excellent coaches and trainers across the nation, all trained and certified to deliver exceptional results, ensuring that we can effectively complete any assignment, large or small, in record time. Through unparalleled systems and exemplary consultants, coaches and trainers, we are prepared, able and committed to help you reach your highest potential and gain and sustain the edge you seek. Our commitment to your success and our confidence in our ability to deliver is backed by a 100% satisfaction guarantee. ​Dr. Sherry Buffington is an internationally known speaker, consultant, trainer, best-selling author and a pioneer in the field of human potential, motivation and performance factors. She uses her extensive knowledge to educate, inform and inspire people to reach their highest potential in record time and gives them the tools to experience sustained success. Her work has contributed to break-through transformation for hundreds of organizations and many thousands of individual lives and relationships. Buffington is a psychologist with 30 years of research and focused study into human nature, subconscious processes, motivation, relationship dynamics and success principles. She is a leader in the field of personal effectiveness, performance factors, and methods for immediate transformation. She has developed an arsenal of powerful, leading-edge tools that are unparalleled for getting fast, effective, measurable, and verifiable results. Sherry has dramatically raised the bar for excellence in the world of assessments, motivation and performance methods, and in methods for eliminating the subconscious blocks that keep people underperforming. She is the originator and co-developer of the highly acclaimed CORE Multidimensional Awareness Profile (CORE MAP), the CORE Personal Effectiveness Profile (CORE PEP), and the developer of the Rapidly Accelerated Mind Patterning (RAMP) method, which is unparalleled in eliminating mental and emotional blocks, and the Applied Intrinsic Motivation (AIM) method for getting and keeping people motivated and engaged. Sherry has authored and co-authored several books, including the eye-opening leadership and generational awareness book, Exiting Oz: How the New Generation Workforce is Changing the Face of Business Forever and Power Shift: The New Rules of Engagement. She has also created game-changing programs that consistently get rave reviews such as Choice Leadership and The Psychology of Superior Selling. Her clients range from small entrepreneurial enterprises to Fortune 100 corporations. Marc Schwartz has traveled the globe training and consulting with corporate leaders, managers, and sales professionals for over thirty years. He helps them identify and build on the intrinsic motivation that truly drives them to reach their best both personally and professionally. Additionally, he has trained whole teams and organizations on coaching, leadership and sales skills. Marc also coaches corporate leaders, entrepreneurs and individuals who want accelerated results in their life. His coaching approach provides the education, resources and a highly refined process to guide these motivated people in identifying and developing their authentic self, as well as the real passion and purpose that will drive them toward their goals faster, better and easier. Marc is a highly acclaimed speaker and trainer who actively engages the audience in his presentations through the use of experiential learning techniques. Groups regularly report Marc as high energy and able to have audiences laughing one minute and learning some powerful skills and life lessons the next. Since 1988, Marc has built a successful consulting practice and several direct sales organizations. He has presented keynotes, seminars and workshops to over 50,000 people in thirty-eight countries on such topics as Generational Leadership, Coaching, Communication Styles, Sales, Key Account Management, Conflict Resolution and Team Development. 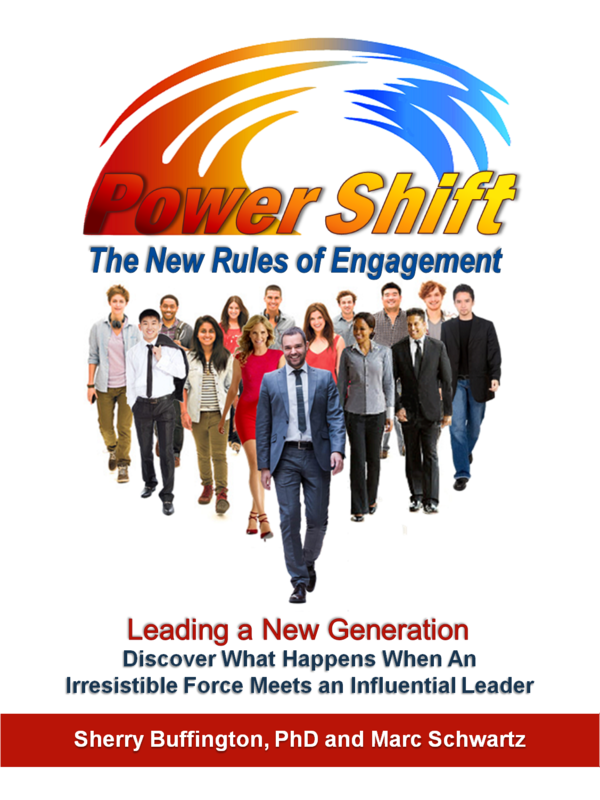 Marc is the co-author of Power Shift, a business book on how to lead the new generation workforce. Also he is the author of The Totally Engaged Audience, an eBook on fearless presentations. He has written multiple articles on: training effectiveness, coaching, leadership strategies, emotional intelligence, authentic selling, assessments and more fully engaging your workforce. Marc has a BBA in Management and is certified as a Clinical Hypnotherapist, Corporate Coach, NLP Practitioner, CORE MAP Facilitator and RAMP (Rapidly Accelerated Mind Patterning) Practitioner. Gina Morgan, CMCC, is a personal and executive coach, trainer, certified Master CORE analyst and executive coach, trainer, certified Master CORE analyst and trainer, and author. Her direct approach coupled with her ability to truly connect with her clients allows her to get to core issues rapidly and help clients overcome old conditioned patterns and roadblocks that have been preventing them from achieving their desired outcomes personally and professionally. Gina is also a certified grief recovery counselor which gives her a unique ability to tap into and heal pain points that may be affecting productivity and outcomes. She is an expert in the areas of leadership and inter-personal effectiveness, including communication, diplomacy, stress management, interpersonal dynamics and team effectiveness. She has over 20 years of experience helping clients develop their natural strengths, improve communications, develop greater levels of EQ, improve relationship outcomes and maximize personal productivity. She has developed curriculum for numerous adult training programs as well as editing and curriculum services used by several community colleges and universities. Gina is co-developer of the highly acclaimed CORE Multidimensional Awareness Profile(CORE MAP) and the CORE Personal Effectiveness Profile (CORE PEP). Her clients range from individual entrepreneurs to Fortune 100 corporations.